Kids these days. Just think they know everything. Well, Cloud Nothings‘ Dylan Baldi decided to give it a shot and put his money where his mouth allegedly was. Dropping out of college at 18 and stocking up on CD-Rs, he had an album. Since then, the Cleveland band has been signed to Carpark Records and last month released the critically acclaimed Attack on Memory. Although the first single, “No Future/No Past,” is a broodingly dark track (accompanied by a wickedly creepy video), it does not have the same uptempo, indie rock sound as pretty much the remainder of the album. Having said that, Baldi even cranked those tracks up to 11. As with most young people (it was not immediately clear if he was even allowed to attend this 21+ event), he gets excited on stage and the screaming Dylan Baldi took over for several songs. Gotta give it to him though, he gave 110% on every song. Most of Memory was performed, along with a few earlier selections, including “Hey Cool Kid,” “Forget You All The Time” and “Understand At All.” It’s the new stuff, though, that is garnering attention from fans and critics alike. A departure from the lo-fi beginnings, Memory is reaching out to a bigger audience. 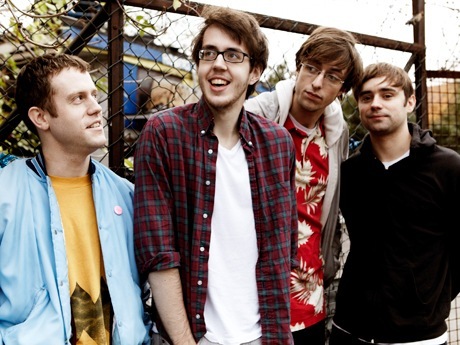 Whether channeling Nirvana or The Strokes, Cloud Nothings have that indie edge that keeps your foot a-tapping. Opening the evening was Atlanta’s Gold-Bears, a “crash pop” band that hit the ground running. The driving indie-pop songs were mostly fueled by the new drummer (“the old drummer sucked”), who burned a million calories that night. Promoting last year’s Are You Falling in Love, the Bears have a clean sound that the crowd clearly appreciated. The night’s big surprise was Italy’s A Classic Education. With a tight band, great musicians and a lead singer with a great voice and stage presence, there’s no where to go but up for these guys. Playing several catchy tunes from their two full-lengths Call it Blazing and Hey There Stranger (both on Lefse Records), the band did a fine job keeping the energy going, after just flying in the day before from Europe.